For over fifty years Sun Myung Moon, the leader of the Unification Church movement and a host of organizations dedicated to advancing his Unification philosophy have striven to provide a decisive spiritual influence around the world. This 81-year old Korean man (here pictured with his wife Hak Ja Han) is the head of a multinational conglomerate of various organizations seeking to establish a new global culture based upon his controversial vision of a spiritually restored humanity centered around his controversial and unorthodox re-interpretation of Christianity. And as this article is being written, Moon is currently crossing the United States on what is being billed as his final national speaking circuit , the "We Will Stand Tour". Supposedly aimed at fostering interreligious and ethnic unity as a means of arresting the moral decline of our nation, the tour is actually one of Moon's well-publicized efforts to establish himself as a leading spiritual figure in our day, an attempt that he has been continuously engaged in since his arrival in the United States in 1972. With the resurgence of a conservative political climate in Washington D.C., the waning Unification movement's organizational zeal has, if anything, redoubled, seeking to once again portray Moon, in the words of Unification leader Chung Hwan Kwak, as "no ordinary man." (1). The tour provides Moon still another opportunity for him to emerge from the shadows of obscurity draped in the U.S. flag and presenting himself as a pro-democracy humanitarian, a free-enterprise advocate, a generous patron of cultural exchange and a family-values champion of Judeo-Christian morality. Content for the time being to remain in the distance from his creations, Moon's behind-the-scenes presence has been extensive. His religious foundations have sponsored many openly ecumenical interreligious dialogues (such as the Assembly of the World's Religions in 1985), as well as innumerable outreaches to Christian ministers and leaders in outright attempts to recruit new Unification supporters, if not disciples. 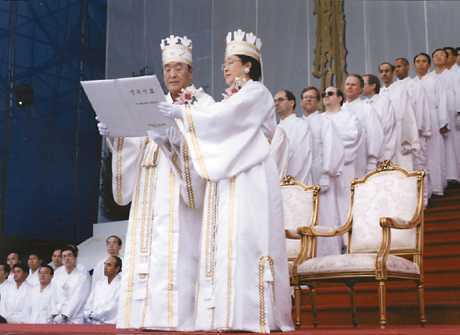 In that same year, while he was imprisoned for tax-evasion and had to run his organization form behind bars, Moon's Unification Church sent out to 300,000 ministers boxes of books, videos and pamphlets "explaining" Unification theology. One front group even financed in the early 1980's the creation of the ill-fated Hollywood motion picture Inchon, commemorating the Korean War amphibious battle (even starring Laurence Olivier and Jacqueline Bisset). It was a Moon-funded effort that resulted in the 1995 financial bailout of one-time Moral Majority leader Jerry Falwell's Liberty University in Virginia and the 1992 underwriting of the University of Bridgeport in Connecticut. Moon's business ventures include fishing fleets in Alaska to software firms in Korea, and he even has a stake in the Smith & Wesson arms manufacturer's business operation. His ownership of the Washington Times and other newspapers has provided for his movement a means of influencing public policy through journalistic means, and this is a fact not lost on the Reagan and Bush administrations in the past twenty years who used them as sounding boards for their own political brinksmanship in Washington and Latin America. Despite all of this amazing activity, and the fact that Moon's relationship to the Bush family has been a matter of public record, little is said about it in the news media, something even more astonishing in light of the fact that Moon's political fund raising prowess -- and honorarium bestowal -- has always resulted in millions of dollars for former President George Bush's appearances at Unification group functions. Other respected leading figures have enjoyed Moon's "generosity" such as scholar Huston Smith, comedian Bill Cosby, and civil rights activist Walter Fauntroy. In Scott's perspective, Moon's work occupies a healthy and positive role in the world today. An idyllic "peaceable kingdom" where a true unity in diversity of human experience emerges is what he believes Unification sets out to accomplish. Later, Scott defines Moon's work as a literal unification of world religions, "a decisive contribution to humankind's movement from the state of tribalism to universalism" (4). This universalism has been the long-standing goal of human progress by many religious and philosophical figures and movements throughout history, and in today's postmodern spiritual climate, such an elusive goal sounds quite noble to the ear of the "spiritual." Yet behind this seemingly benign vision is a far more jarring picture that is in the sharpest contrast to historic, orthodox Christian doctrine and belief, a picture all Christians involved with him overlook by omission - or commission. This is the side of the Moon empire that you aren't supposed to see. Despite all of his movement's efforts at providing for their "True Father" a serious twenty-first century face lift, Moon himself still remains in heart and soul the same individual he was in the twentieth century, as does the essentially dangerous and cultic nature of the entire movement. Those Christians cooperating with Moon's work either fail to see - or refuse to recognize - that the true nature of Moon's teaching and practice have been largely hidden by a tireless Unification public relations effort, and that behind its' carefully groomed public image, it is actually quite antichristian and blasphemous in many respects. To establish his own teaching, Moon freely reinterprets and redefines what Christianity is, a deconstruction of established Biblical truth that he has excelled at for over 50 years, all the while declaring his avowed fidelity to the Christian faith. These same Christians don't seem to realize that for all of Moon's avowed passion for "Family values", his own "True Family" is hardly an ideal model to emulate and - most puzzling of all - they seem to overlook the documented evidence of the Unification Church's years of deceptive recruitment, destructive mind control practices, unethical fundraising practices, and manipulative religious abuse that has disrupted and destroyed many lives around the world. These issues seem ignored by many who currently work with Moon - whether out of sincere agreement with moral values his organization appears to uphold or out of dependence upon the cash flow of a Unification organization that subsidizes their own career or cause. It is how Moon has been doing this that we will now more carefully examine in the next three articles.